Combining technologies can deliver a detailed and robust understanding of flood risk. The fundamental principles (physics) to enable us to calculate flood risk have been well understood for a long time. We have the likes of Isaac Newton and Archimedes to thank for that, and we have a good selection of well-developed and proven software packages that enable modelers (novice and expert) to apply these principles. The continual advances in these software packages coupled with significant and continuous advancements in computing technology, data capture methods, and data availability have fueled the demand for more detailed and robust analysis, which also provides greater understanding of the certainty (or uncertainty) of flood risk. This is particularly the case within cities where flood models need to be run at high spatial resolutions to resolve complex topographies (such as roads and buildings), which increases the computational effort. Furthermore, assessing a range of options that could be developed to improve cities’ resilience to floods in the future requires many computer simulations, especially when considering the uncertainty of future climate variability. With the demand for increased analysis, which may require many thousands of simulations that take several hours or even days to complete, there is the need for more computational resources and the specialist software licenses needed to undertake the analysis. For many organizations, the cost associated with this is prohibitive or simply not a wise investment as there may be long periods of time when they are not in use. For some years, there has been growing expectation that cloud computing will be the solution, and provide easy, unlimited, and affordable access to the computing resources needed. In practice, software vendors and users have found it either technically challenging, impracticable, or not cost effective. By combining technological solutions, there is now, through the Flood Cloud service, a highly effective, simple-to-use, and cost-effective solution that is available to anyone who wants to undertake flood risk modeling. It has provided the platform to create a step change in the way we understand and interpret our modelling possibilities. Flood Cloud is a collaboration between Jacobs and Parallel Works that seamlessly integrates Jacobs’ Flood Modeller software with the Parallel Works platform and cloud platforms such as Amazon AWS and Windows Azure, to provide an innovative cloud-based platform that empowers users to run compute-intensive simulation and data analytics workflows faster, at greater scale, and more cost effectively than ever before. Flood Cloud enables models to be built using Flood Modeller Pro’s industry-leading 1D and 2D solvers to be run in the cloud. It also integrates with third-party flood modeling software such as TUFLOW (from BMT) and HEC-RAS (U.S. Army Corps of Engineers) and are developing integration with SWMM (U.S. EPA). By providing clients with the opportunity to select and run their preferred model(s), it enables them to utilize the most appropriate tool for each modeling application. Currently hosted by Amazon, Flood Cloud is built on a secure and trusted platform, ensuring model data and personal details are safe and less prone to typical in-house IT infrastructure challenges. Flood Cloud is available globally to help clients, industry policymakers, government bodies, and academics. In essence, it helps anyone who needs to understand flood risk. 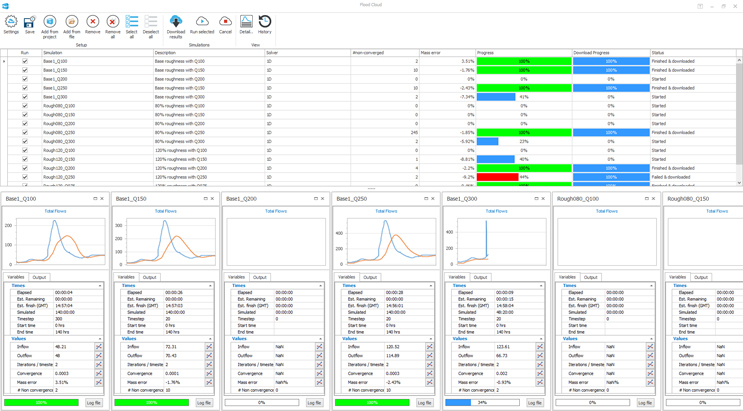 Flood Cloud allows users to run Flood Modeller, TUFLOW, and HEC-RAS simulations in the cloud rather than on their own machines. This allows users to undertake many more simulations concurrently than they could on their own PC (users are able to run thousands of simulations at the same time), removing any license restrictions users face when running models locally. Furthermore, the pay-as-you-go service enables clients with growing or fluctuating project demands to rapidly scale up their processing capacity when workloads increase or when they find that a more detailed analysis is required. It also allows clients to cut out the initial cost of software as well as the ongoing maintenance of high-performance hardware. Being able to run many simulations in minimal time has many benefits. Until recently, the required outputs from flood modeling were typically selected water levels and flood extents from a handful of simulations such as three return-period events (1 in 50, 1 in 100, or 1 in 1000 year). Now, a much richer set of results are required covering 10 or more annual exceedance probabilities with various climate change scenarios and a range of flood management options. This often requires hundreds or thousands of simulations to be undertaken, each with data sets of many gigabytes in size. This, together with the move towards detailed 2D modeling, has resulted in a step change in the computational resources needed to undertake the modeling. Flood Cloud provides the answer by providing an almost infinitely scalable resource pool of processors tightly integrated within Jacobs’ industry-leading flood modeling software. As flood modeling demands continue to increase, and in order to better understand flood behavior and identify robust flood management options, more simulations are required combined with the pressure to act quicker and be more efficient. Flood Cloud is designed to help users and clients respond to all of these situations. It enables them to embrace the challenges of the Big Data environment while delivering a more informed understanding of flooding. For example, a project may require simulations for five sets of inflow boundaries, at four epochs (future time periods), with three climate change scenarios, and for three flood management options. For a two-hour base simulation runtime, this equates to more than two weeks of continuous running if a single standalone license is used. With Flood Cloud, all of the 180 individual simulations can be undertaken at the same time — saving the project two weeks. In a recent study along the river Thames upstream of London, Flood Cloud was used to run multiple simulations that helped evaluate the impact of catchment-wide storage schemes to mitigate climate-change-driven increases in fluvial flooding for the Thames Catchment, potentially delivering improved protection to thousands of homes and businesses. By reducing the computational resource constraint on modeling studies, Flood Cloud has the potential to vastly improve the understanding of future flood risk in cities. There are many factors to consider when undertaking a modeling study, including future climate projections, population growth and associated developments, model uncertainties, and critical infrastructure. Undertaking a full assessment of these on flood risk in cities is vital to increase the confidence decision-makers can have in predictions of flood risk. This requires running many simulations, which is often infeasible due to the amount of time it would take to run these. 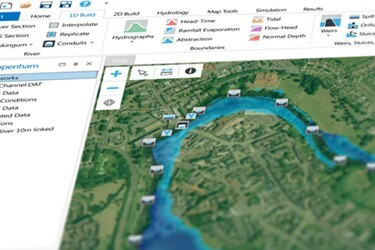 Being able to run these simulations in the cloud will allow city planners to gain a greater understanding of the areas at risk of flooding and will help them to plan future developments that factor in future flood risk, while at the same time undertake mitigation measures to reduce it. Furthermore, the cloud also allows the possibility to quickly explore how a range of possible infrastructure options can improve flood risk, given these other uncertainties. By doing so, flood cloud can improve cities’ resilience to flooding and help protect critical infrastructure into the future. In addition to flood risk studies, Flood Cloud also has the potential to revolutionize real-time flood forecasting. Weather forecasts are inherently uncertain, with meteorological services producing ensemble predictions in an attempt to capture these uncertainties. Such uncertainties propagate to predicted river flows and, given the simulation times associated with 2D modelling, it is not possible to run many simulations quickly to produce ensemble spatial predictions of flood risk. Flood forecasts therefore typically rely on much faster 1D modeling and an understanding of the risk of flooding from modeled river levels. Flood Cloud has the potential to change this approach by opening up the possibility of running hundreds of 2D modelling simulations in the time it would take to run one simulation. This would mean that forecasters could not only see a forecast of river levels, they could also map the expected flood extents, in real time, to help inform real-time flood incident management and operational decision-making. The impact of future climatic variability remains uncertain, yet has the potential to significantly increase the exposure to severe flood events in cities. Improving our understanding of flood risk in cities is vital to ensure cities remain as resilient to both present day and future flooding as possible. By allowing users to run many more simulations than they are often able to, Flood Cloud provides modelers with the opportunity to understand flood risk in cities in more detail than ever before. Dr. Jon Wicks, Global Technology Leader (Flood Modelling & Planning), provides leadership for flood modeling, flood analysis, flood forecasting, flood risk mapping, flood risk assessments, and related flood risk management across Jacobs’ global business. He is the technical director responsible for the Flood Modeller software. His focus is on strategy and growth, project delivery excellence, innovation, talent management, and connecting staff globally. Jon has a PhD in Catchment Modelling. Dr. Richard Crowder, Growth Manager (Water Environment – Europe), provides leadership in water and environment services across Jacobs, is the client manager/program manager responsible for the delivery of a program of work for Jacobs’ key client, the Environment Agency (England), and is the Jacobs framework manager delivering Flood Modelling, Mapping and Forecasting services to the Environment Agency (England). He is the strategy and growth director for the Flood Modeller software. Richard has a PhD in Physical and Computational Modelling.